Choosing a wedding suit is not easy. You want something that stands out for the right reasons: too conservative, and it will be forgettable; too out there, and it threatens to make a mockery of the big day. Blue is safe: you know where you are with blue. But navy is perhaps too predictable – it’s nice to have something with a little more zing. A single-breasted, two-button suit is Officewear 101, so that’s out. And although a three-piece is popular, it can be a bit stuffy. So how about double-breasted? It’s traditional enough to show you’re serious, yet stylish enough to be an upgrade from the everyday. In a lighter hue of blue – such as BOSS’s Open Blue [pictured above] – it makes a thoroughly attractive proposition, not to mention a striking counterpoint to bridal white. Our readers can exclusively enjoy complimentary alterations when purchasing a Create Your Look suit in BOSS Stores at One New Change or Eldon Street. Quote ‘Square Mile’ at the point of purchase. The offer is only valid when purchasing a Create Your Look suit (jacket and trousers to be purchased in one transaction to qualify) in participating stores between 9 April and 7 May. The offer is not valid in conjunction with any other promotion. Enter BOSS Menswear. This two-piece suit from BOSS is constructed in midweight stretch fabric for ease of movement – lightweight enough to help you keep your cool, and flexible enough for the all-important first dance. to display at such a life-defining event. Most importantly of all, this suit is versatile. To wear your wedding suit for just one day would be such a waste. We chose this BOSS suit because you’d be able to rock it in a variety of scenarios long after its first outing. The outfit at the top of this story is an unapologetically fashion-forward look. The trousers are worn short with no socks, a clean pair of white plimsolls happily playing supporting role to the suit’s lead. Wearing a polo shirt under a blazer is a perfect way to look dapper but still relaxed. 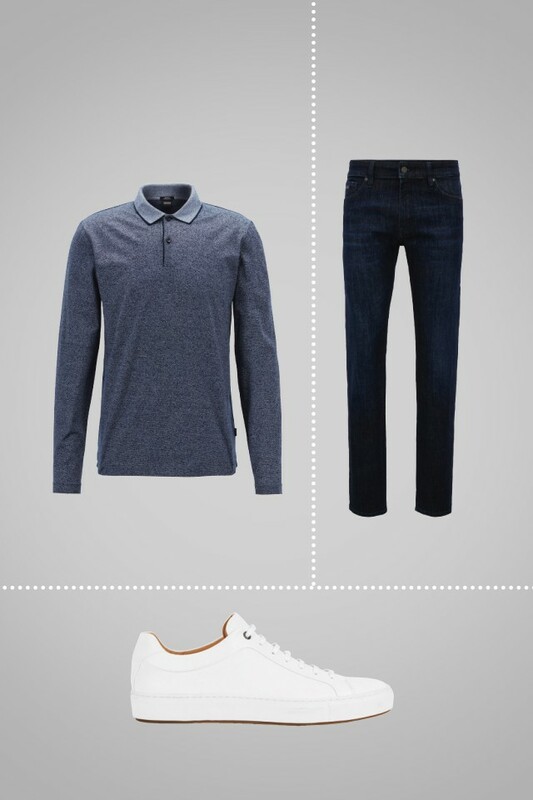 The unstructured nature of a polo shirt’s collar immediately makes your look more easygoing. If you want to unwind further, swap the suit trousers for straight-leg jeans in iconic selvedge denim as in Look 1 [above left]. With stretch for easy movement, these regular-rise jeans from BOSS have been treated with brushing and scraping to deliver an authentic finish. Dressed with the jacket, the look is still casual but with a metropolitan feel. 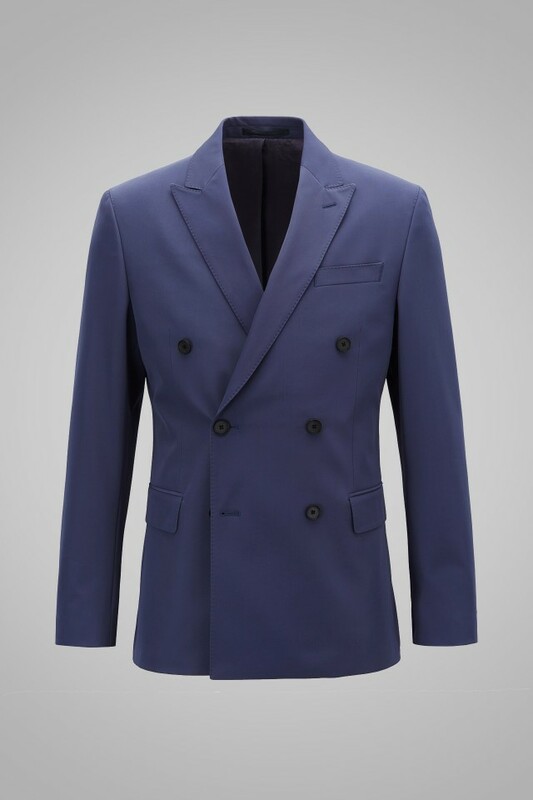 The dark-blue hue is far enough away from the jacket’s lighter blue to complement rather than clash. Look 2 [below centre] embraces the timeless sophistication of Riviera chic. The suit jacket is metamorphosed by teaming it up with a sharp pair of slim-fit white chinos. 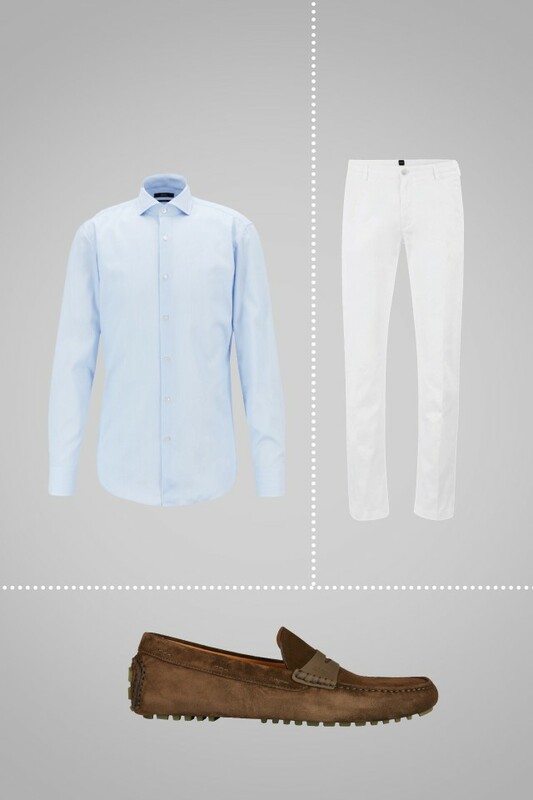 Complete the look with a pair of Italian-made moccasins in calf suede. The BOSS moccasins feature a rubberised penny trim with contrast edges. An injected rubber sole and cognac-leather lining add the finishing touches to this modern pair. Finally, Look 3 [below] is the one for your big day. 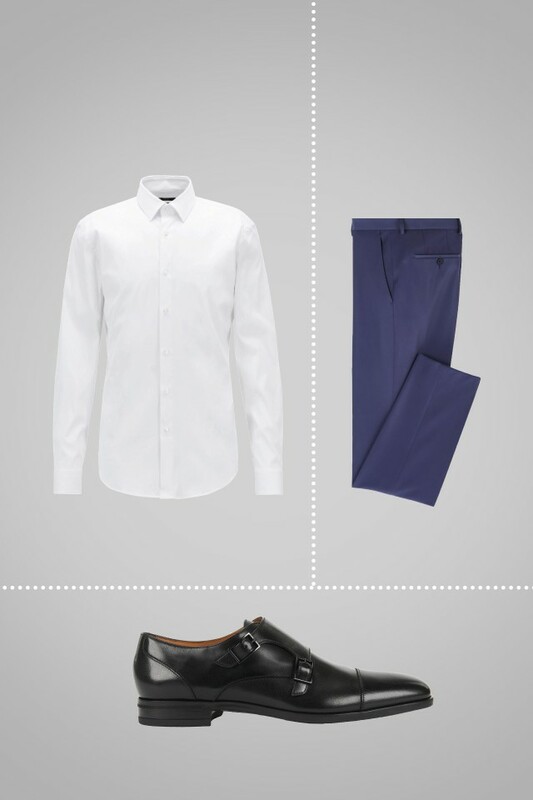 You can’t go wrong with a classic white shirt and a pair of black double monks. Whatever you choose, wear it with confidence – and make sure you’re not late.